VANCOUVER, BRITISH COLUMBIA--(Marketwire - May 14, 2008) - Sherwood Copper Corporation (TSX VENTURE:SWC)(TSX VENTURE:SWC.DB) today announced that the 2008 exploration program at the Minto Mine located in the Yukon has commenced, discovering new areas of copper-gold mineralization in previously undrilled terrain west of the Minto and Area 2 reserves. The 2008 exploration program has a budget of $4.4 million and is expected to include approximately 20,000m of drilling. Drilling to date has evaluated the potential of a large area west of the Minto and Area 2 deposits covered with a thick layer of semi-frozen overburden that precludes the use of conventional soil geochemical and geophysical techniques successfully used elsewhere on the property to discover new deposits, and requiring drilling when the ground is frozen. Thirteen holes were drilled in this area, with some notable successes, as summarized in the table below (complete results are attached). The drills have now moved on to other, higher priority objectives that can be drilled year round. "With new copper-gold discoveries in our first holes, we are off to a strong start with our 2008 exploration program," said Stephen Quin, President & CEO of Sherwood Copper and Minto Explorations Ltd. "These new discoveries open up previously unexplored areas on the Minto property. Drilling has now moved on to other priority areas identified in 2007, including possible extensions to the Area 2 deposit, further definition of the Area 118 and Ridgetop discoveries to increase the resource confidence level, as well as exploring additional targets," he said. "This exploration program is a component of our overall strategy to maximize the value of the Minto Mine by developing additional high grade reserves that could justify further increases in production by increasing mill throughput. Areas that were drilled where no mineralization was discovered will be considered as possible alternative waste dump locations that could be utilized at a lower cost than currently planned." Sherwood has budgeted a $4.4 million, 20,000 metre drill program for 2008. Partial results are available from the first holes completed as a part of this program, and are outlined herein including encouraging new copper - gold intercepts in areas that had not previously seen exploration drilling. Drilling has now moved to other 2008 priority targets. 1. Upper Minto Valley - Given that the Minto Valley bisects and separates the main Minto and Area 2 deposits, it is considered highly prospective. However the valley has substantial deposits of permanently frozen overburden that prevents penetration by conventional geochemical and geophysical methods used at Minto such as soil sampling, magnetic and induced potential surveys. The first part of the 2008 drill program was designed to drill test the western portion of this area to gain much needed geological knowledge in this otherwise untested area. The wide-spaced 2008 drilling showed the Upper Minto Valley is underlain by a stacked system of foliated granodiorite, the favourable host rock to mineralization at the main Minto and Area 2 deposits. 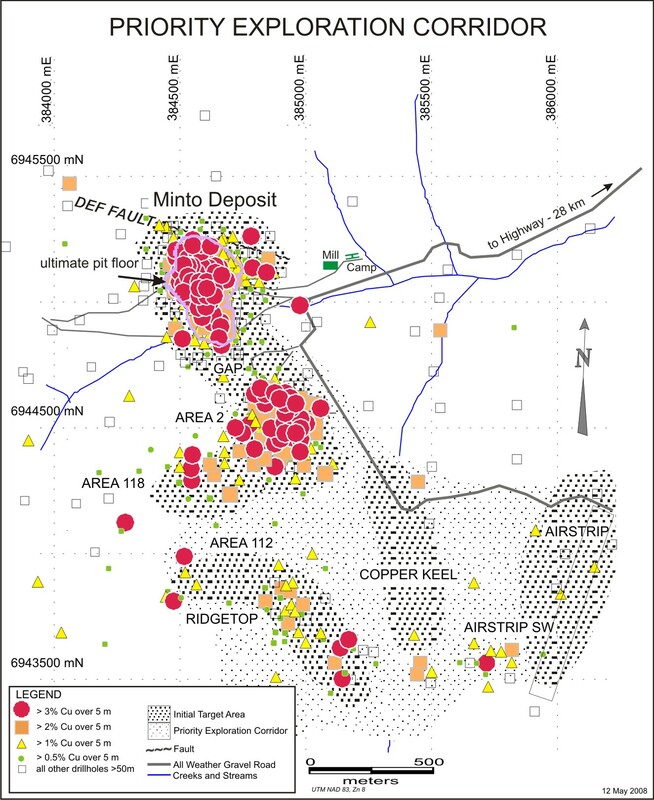 Several 2008 holes in this area intersected moderate to high grades of copper mineralization, similar to that seen in and around other deposits at the Minto Mine. These results are discussed more fully below. 2. Area 2/Area 118 - Drilling in 2007 discovered an extensive mineralized system at Area 118, immediately west of the Area 2 deposit. Current geological modelling suggests that Area 118 is an up-faulted continuation of the Area 2 deposit. A combined Area 2/Area 118 resource model, based on 2007 drilling, is currently in process, the results of which will be reported in the coming weeks. The location of Area 118, immediately adjacent to a proposed open pit designed to exploit the Area 2 mineral reserve (as outlined in the Pre-feasibility study the results of which were announced December 12, 2008) makes this a high priority to increase confidence in an Area 118 resource, sufficient to support conversion to reserves and potentially justify further mill expansions. Both Area 2 and Area 118 remain open to further expansion, and this potential will be evaluated in 2008. 3. Ridgetop - Drilling at Ridgetop in 2007 was designed to build off a known occurrence of near surface copper-gold mineralization discovered by ASARCO in the 1970's. 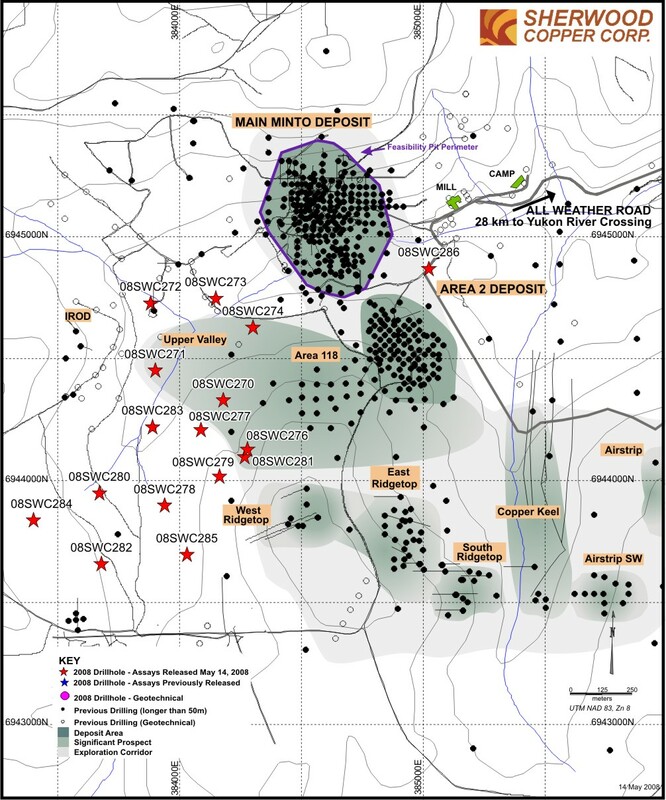 While the grades in the Ridgetop area are moderate as compared to the main Minto and Area 2 reserves, the near surface nature of this mineralization (within a few metres of surface) presented an opportunity for the definition of very low strip ratio reserves. Drilling completed in 2007 is expected to result in the definition of an initial resource at Ridgetop (to be announced in the coming weeks), which will be further defined in 2008. In addition, 2008 drilling will aim to expand the Ridgetop mineralization. 4. Other Targets - Several high priority exploration targets, including Airstrip, Copper Keel, Ridgetop West and Minto Ridge, will be evaluated in 2008 for their potential to host new areas of high grade copper-gold mineralization. Area 118SW: Hole 08SWC-276 drilled into an area postulated to be a faulted southwest extension of the Area 118 deposit. This hole intersected very high grades at similar depths to the Area 118M horizon, including 8.9m grading 2.14% copper and 0.75g/t gold with a subinterval of 6.0m of 3.10% copper and 1.10g/t gold. Minto Valley: Holes 08SWC-270, 08SWC-271 and 08SWC-274 drilled into a roughly triangular shaped weak magnetic feature whose signature is believed to be muted by the deep overburden cover in the center of the Upper Minto Valley. All three holes cut significant zones of copper-gold mineralization, including significant intervals grading approximately 1% copper in holes 08SWC-271 and 274. Hole 08SWC-271 intersected 1.55% copper and 0.80g/t gold over 5.1m within a broader intersection grading 0.85% copper and 0.35g/t gold over 17.1m, while 08SWC-274 intersected 1.17% copper and 0.44g/t gold over 7.1m within a broader intersection grading 0.68% copper and 0.27g/t gold over 14.4m. Because of the distance separating these two holes (more than 425m), no conclusions can be made about continuity of mineralization between these intercepts at this time. Un-named: A single hole, 08SWC-285 drilled at this un-named location within the Upper Minto Valley more than 400 metres southwest of the West Ridgetop prospect intersected 23.2m of 0.79% copper with two subintervals grading better than 1% copper: 3.1m of 1.7% copper and 4.5m of 1.25% copper respectively. At the time of this news release, gold assay data was unavailable. Independent NI43-101 compliant resource estimates incorporating all of the 2007 drilling at Area 2, Area 118 and Ridgetop are nearing completion and are expected to be released in June. Meanwhile, Sherwood is already concentrating on both in-fill and step-out drilling to increase confidence in, and potentially expand, these areas of copper-gold mineralization. Sherwood Copper's objective is the profitable production of base and precious metals from high grade, open pit mines in Canada. Sherwood's first operating mine, the high grade Minto copper-gold mine in Yukon, Canada, was built on budget and ahead of schedule. The Minto Mine is one of the highest-grade open pit copper-gold mines in the world, and is forecast to be a low cost producer. Aggressive exploration on the Minto property has yielded significant success, providing Sherwood the opportunity to 'grow from within' by expanding the resource and reserve base, potentially leading to further production increases. To further accelerate its production growth, Sherwood intends to pursue merger & acquisition opportunities that fit its business model and, in March 2008, Sherwood acquired more than 93% ownership in Western Keltic Mines, owner of the high-grade Kutcho copper-zinc-gold-silver deposit in northwestern British Columbia. Sherwood aims to repeat its successful development of the Minto Mine at the Kutcho project. The technical information in this news release has been prepared in accordance with Canadian regulatory requirements set out in National Instrument 43-101 and reviewed by Stephen P. Quin, P. Geo., President & CEO for Sherwood Copper Corporation. The exploration activities at the Minto project site are carried out under the supervision of Brad Mercer, P. Geol., V.P. Exploration for Sherwood. The analytical method for copper and silver performed by SGS Laboratories under a contract arrangement at the Minto Mine Site, Yukon includes digestion in aqua regia followed by absorption spectroscopy. Gold is measured using fire assay with atomic absorption spectroscopy; analysis is performed by SGS Laboratories at Red Lake, Ontario. When visible gold is noted in drill core samples or regular analytical values exceed 5 grams per tonne, the pulp and screen metallic assay method is used to determine total gold content and gold content of different size fractions. This is considered industry best practice when dealing with coarse gold mineralization where a nugget effect is suspected. The result of the pulp and screen metallic assay is accepted as the most representative value and used in the assay database for resource calculations. Blank and standard samples are added to all sample shipments prior to submittal to the lab for quality assurance and quality control. If more than two check samples assay outside of expected ranges, the work order is re-assayed. After the completion of planned drill programs, random check assays will be carried out by ALS Chemex of North Vancouver, BC. Assay intervals reported herein are drill core lengths unless otherwise stated. Because the known deposits are essentially flat lying and most drill holes reported to date are vertical, true widths are generally expected to be the same as reported core lengths unless otherwise stated.